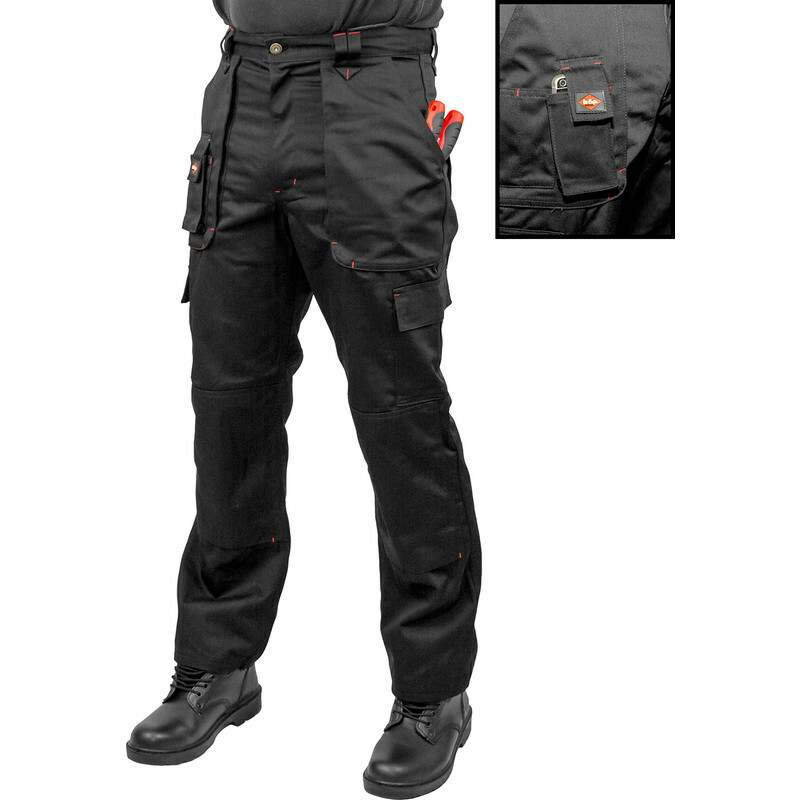 Lee Cooper Heavy Duty Multi Pocket Work Trousers 38" R Black is rated 3.7 out of 5 by 7. Rated 4 out of 5 by Steve33 from Good trousers, sizing not so good These really are good trousers, no question about that. Ideal for winter as they appear to be wind proof and very warm. Lots of pockets and have a good quality, heavyweight feel to them. The reason I only gave four stars is due to the sizing. Now, I’m a 36 waist, so obviously I ordered a 36, upon opening the bag I felt like a child on Christmas day, eager to try on my new trousers and do an elaborate ‘fashion show’ for the wife I came upon a rather unfortunate problem. They didn’t fasten, not even close… This was most embarrassing, whilst trying my best to ignore my wife’s jibes of ‘fat knacker’ and ‘who ate all the pies’ I decided to get a tape measure and measure my presumably larger waist. Panic not, the tape clearly showed me still as a 36, the wife laughed less, and I returned the ‘child size’ trousers and swapped them for a 38 inch waist. So, read this before you buy, you are *probably* less fat than you think. Rated 3 out of 5 by Mickey 933 from Too tight I bought two pairs size 34 waist the same as all my other trousers. They are way too tight. I am waiting till I get time to exchange them. Rated 5 out of 5 by Dibby from Perfect fit Tried some of cheaper versions but these fit as they should. You can rely on size number. Rated 4 out of 5 by MudMonster from Sizing way off Had to order a size 36" waist for my colleague whom normally wears a size 32" waist. Having previously ordered & returned a size 32" waist. Rated 4 out of 5 by MudMonster from Sizing way off. Bought these trousers for a work colleague as work issue clothing. We ordered a 32" waist as that is his usual size. However they are more like a 28" waist. Returned and ordered a 36" waist. This was a gamble but they are just about right size wise. Rated 5 out of 5 by TechieDai from Great work trousers! I bought a pair of these cargo trousers about 3 months ago and found them so comfortable that I recently bought another pair. They are very well made from durable material and they wash very well. There are plenty of large pockets and small tool pockets, ideal for an electrician or technician. They have a silicone rubberised meshing on the inside of the waistband that prevents the trousers from slipping down when you're working- and it actually works! Also, they are an incredibly comfortable fit and sometimes do not require a belt. Well worth the money.